After a relatively late night at the Lowell Observatory, I still managed to get out to Kachina Wetlands again by about 5:30. This time I spent a while in the pine woods, and was rewarded with a Grace’s Warbler way up in the treetop. 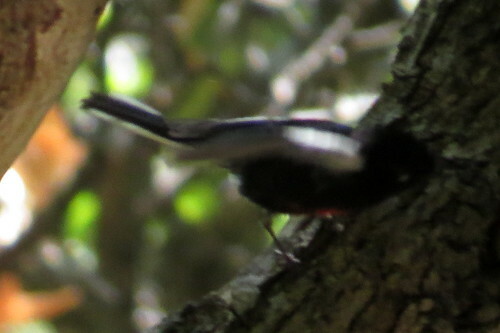 Walking around the edge of the area, I found another lifer – Mountain Chickadees — but they were a bit too active to get a good pic. 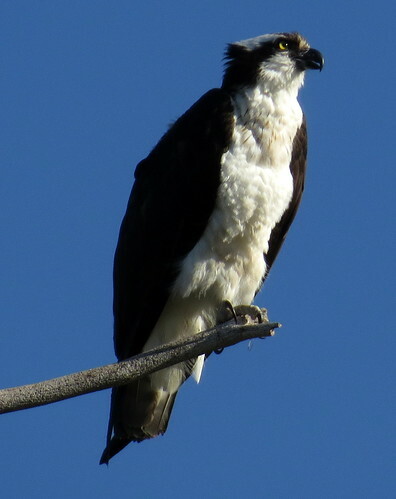 But nearby in a dead tree, an Osprey perched for quite a while. 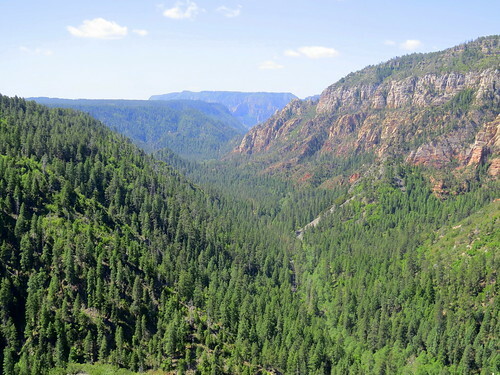 And then we headed down into the canyon. We were surprised at how crowded all the parking areas were on a Tuesday morning, but we were able to stop in a few spots. 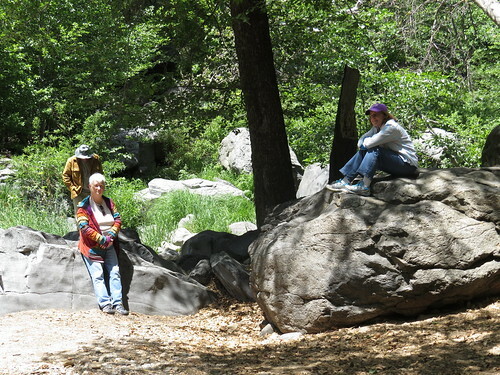 We spent a couple of hours at Banjo Bill picnic area, which turned out to be both lovely and quite birdy. 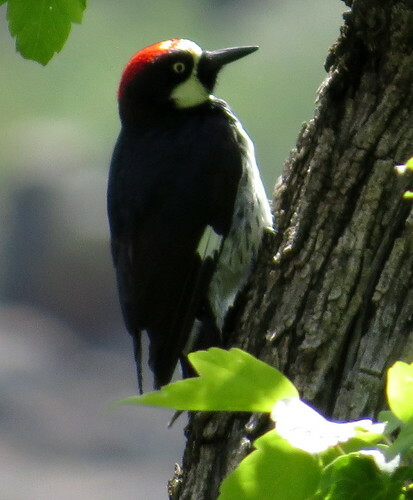 One of the first birds we saw in the parking lot was an Acorn Woodpecker. 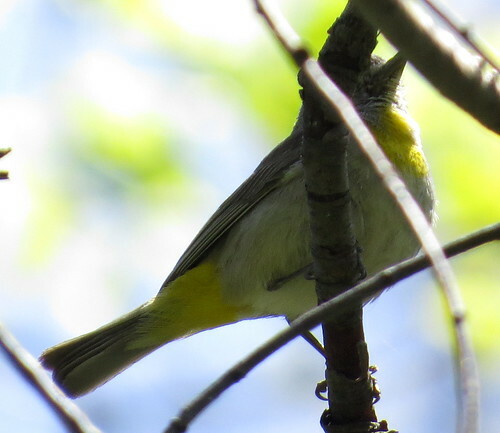 I also got a good view of a Virginia’s Warbler, but the only pic I could get was less than stunning. 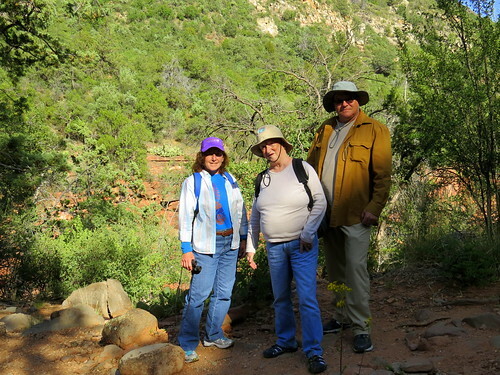 Eventually we went on to Sedona, where we had Mexican food for lunch (and took forever to find a parking place). 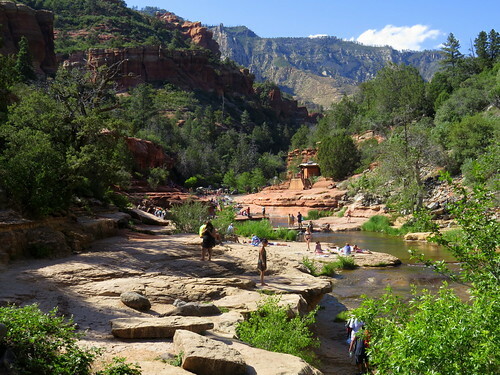 After lunch, we decided to pass on the Institute for Brain Education or getting our chakras read, and instead went back northward to Slide Rock State Park. We just did some light hiking and called it a day. 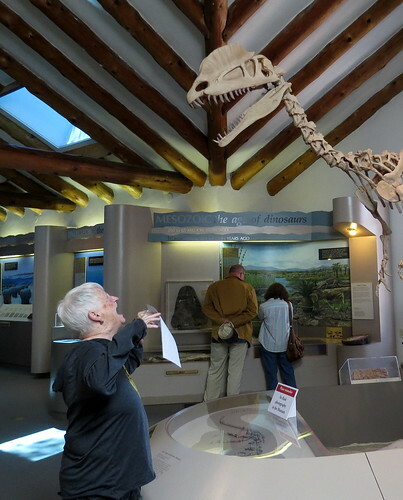 Robin decreed that Monday would be a day without canyons or horses, so after my pre-breakfast outing to Kachina Wetlands, we set out for the Museum of Northern Arizona. It’s a fairly small museum in Flagstaff, but it’s really well laid out and has some great stuff. We started with the tour through the geological and paleontological history of the area. 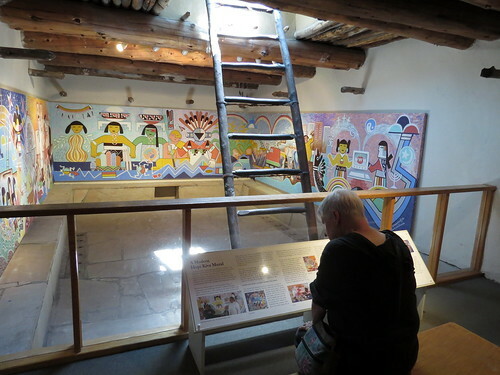 Then the majority of the museum is devoted to native American prehistory and history, with a lot on the Anasazi, as well as some on Navajo, Hopi, Zuni, and Pai. It had some exquisite textiles and jewelry. And this modern Kiva mural done specially for them by two Hopi artists. 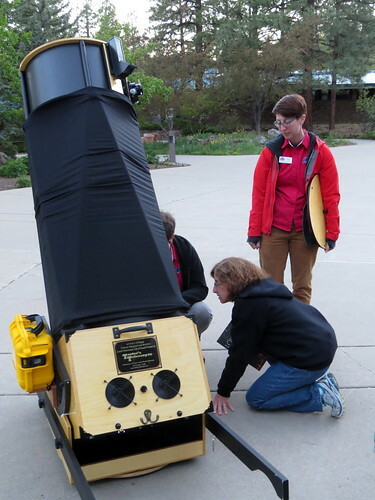 Afterward, we went back to the hotel and rested for a while, and then in the early evening we went to the Lowell Observatory. Pluto was discovered here, and a lot of early work on the expansion of the universe. Peggy was in heaven. 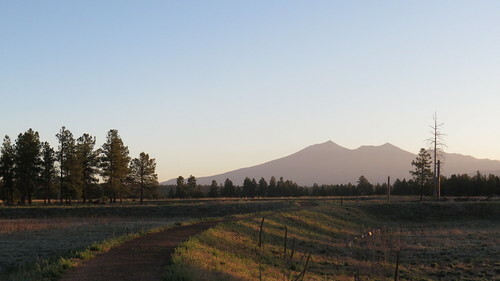 Kachina Wetlands is a waste-water treatment facility in Flagstaff. If you bird, you know that sewage treatment ponds are often great birding spots; if you’ve birded in enlightened places, you know that some of them are really terrific habitats. Kachina Wetlands is one of those. I’d seen it as an ebird hotspot while planning the trip, but I didn’t really know what to expect. You park at the end of a dead-end road through a trailer park and walk in through some trees, to be met with this view. There are multiple ponds separated by dikes, some dry and others full; several have islands in the middle, and there are tall pines surrounding the area as well as on the islands. Cattails fill a lot of the ponds, while the dry areas have tall grasses and scrub. Loads of good habitat. First lifer of the morning was Pygmy Nuthatch, which, though close to me in some pines, was too active to catch for a photo. 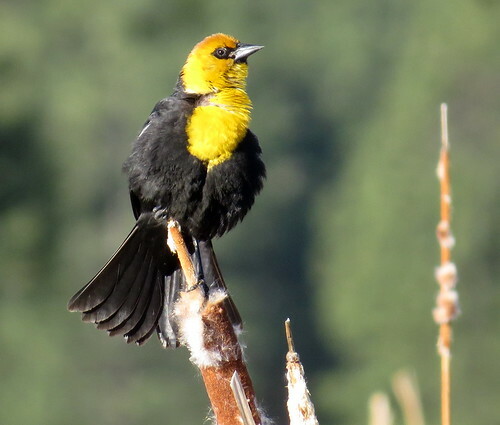 Next I saw a splash of yellow in the cattails and heard an unfamiliar harsh call — Yellow-Headed Blackbird. This one is hard to miss. 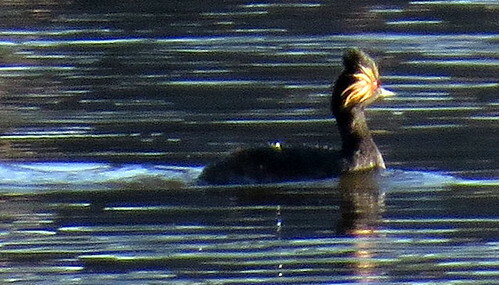 I also got another chance to see Eared Grebes, as well as a Pied-Billed Grebe with a bunch of fuzzy young. Some Canada Geese had babies foraging right on the trail, and they weren’t getting out of my way at all. One adult just stood there and hissed at me while I went by. I had promised to be back by 7:30 for breakfast, so I was heading back when I heard an unfamiliar sparrow song in the tall grass. I looked, and I could see the bird way out there perched on a stick. 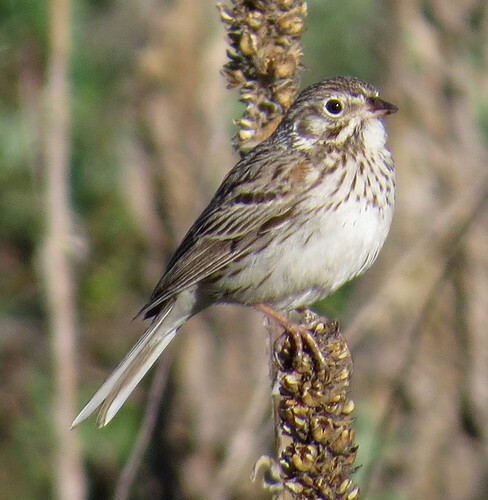 Somehow I dredged up Vesper Sparrow (studying calls in advance paid off?) and I played the song to check. Matched perfectly, and next thing I knew he was perched right next to me and singing. On the way out, I also saw a Say’s Phoebe — not a lifer, since I saw the one that showed up in St. Gen county earlier this year. And finally, just as I was getting back to the car, a little flash of blue in a pine tree turned out to be a Western Bluebird. Four lifers before breakfast. You are currently browsing the archives for the Flagstaff category.